In november 2016 bracht Rozekruis Pers uit Haarlem de Engelstalige editie van het boek ‘Spirituele Kerst’ uit met de titel ‘Spiritual Christmas – guiding hand for inner reflection and inspiration in the Christmas season’. The Christmas season is the perfect time to focus on the things that really matter in life. During this dark time of year we receive an ideal opportunity for inspiration and renewal. So why not take some time for reflection and inspiration during the season of the Holy Nights and the Holy Days? Countless people have preceded you and experienced its beneficial influence. 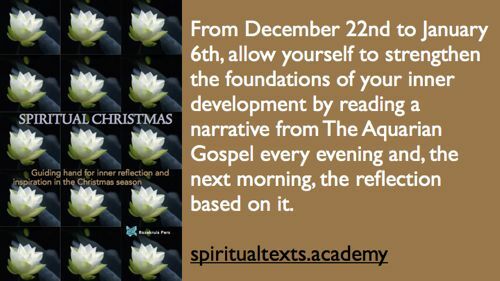 From December 22nd to January 6th, allow yourself to strengthen the foundations of your inner development by reading a narrative from The Aquarian Gospel every evening and, the next morning, the reflection based on it. Dit bericht werd geplaatst in Jezus, Kerstbezinning en getagged met Christmas season, guiding hand, Spiritual Christmas, the Aquarian Gospel op 18 december 2016 door André de Boer.